Our young family of 5 growing together as we craft, DIY, eat and play our way through each day. I’ve been working on Dub’s bathroom from some time now. My vision keeps changing as I find little treasures here and there, and it’s becoming kind of an eclectic hodgepodge instead of a well thought-out theme. I guess that’s about perfect for a boy’s space, right? I’d started out planning to use this artwork I designed (check out the free printables), but then remembered the vintage Star Wars metal art I’d picked up at Hobby Lobby awhile ago and thought it would be fun to frame it for this space. I bought custom mats and framed them with Ikea Ribba frames. I wasn’t sure what to put above the towel rack, but when I was out thrifting and found this Wax & Polish sign, I just had to have it! I love the crisp clean lines of the gray walls and white frames against the rustic barn wood vinyl floors and vintage finds. Now I’m on the hunt for cabinet hardware. I’d really had my heart set on using these utility pulls from the hardware store. I just love this look. Unfortunately, they are just a little wide for the cabinet trim so I need to find a new option. Which pulls do you think would be the right option for this space? These are a shorter version of the same utility pulls – they are only 3 3/8″ inches, but would fit the width of our cabinet trim. 2. Or these more modern and streamlined pulls? 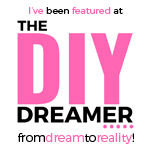 In addition to the fabulous blogs listed on the sidebar, this post was linked up at Lolly Jane. *This post may contain affiliate links. Please review my full affiliate disclaimer in the sidebar. This entry was posted in Uncategorized and tagged Bathroom, big boy, Boy, Decor, Gray Screen, Rustic, Sherwin Williams, Sherwin Williams Gray Screen, Star Wars, vintage, vinyl barn wood floors, Wax & Polish on August 10, 2015 by fivemarigolds. 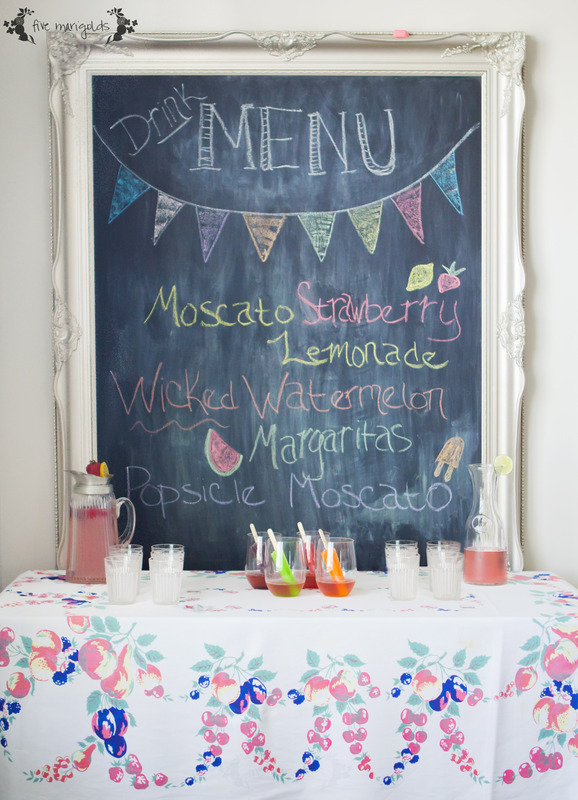 A signature drink is a fun and refreshing addition to your summer soiree! We recently had a BBQ and served these three drinks that were a big hit! Mix the following ingredients in the blender and serve with a wedge of watermelon or slice of lime! Mix the following ingredients in a large pitcher and garnish glasses with lemon slices. 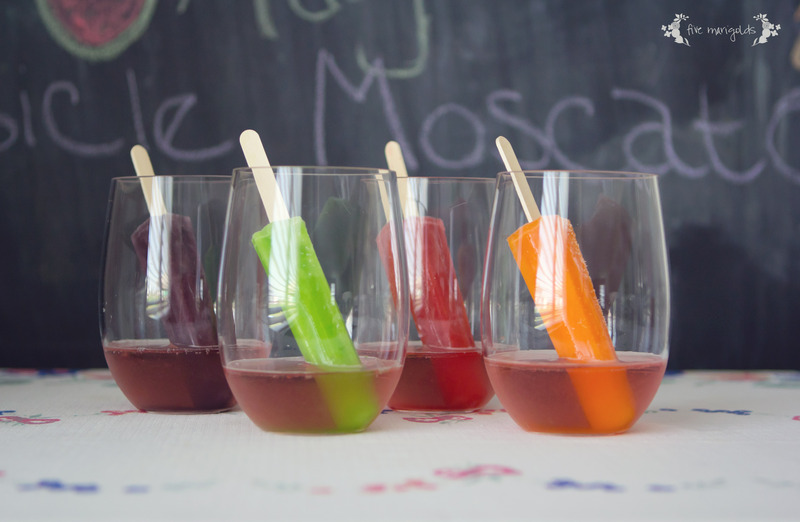 This one is super complicated: pour three parts pink moscato and one part Simply Lemonade into a cup and place an unwrapped popsicle in the glass. Drink once the popsicle has melted! These are my three favorite tried and true summer cocktails. Do you have a signature drink? Tell me about it in the comments below! This entry was posted in Uncategorized and tagged adult beverages, cocktail, drink, moscato strawberry lemonade, pink moscato, popsicle, signature, summer, wicked watermelon margarita on July 25, 2015 by fivemarigolds. I’ve been getting lots of questions on items I’ve shared on Instagram, so I thought this week I’d share a few of my favorite things. I adore this Sleepy Lamb Eye Mask. Price = $8. Eve sleeping in later = priceless! Our Cuisinart Ice Cream Maker gets used all. summer. long. We’ve tried and love nearly all the recipes that come with it, and also use it to whip up a few of our own exclusive homemade recipes, as well. Buy it along with the extra freezer bowl at Williams-Sonoma now for just $56 with the 20% discount! While you’re at it, pick up one of these adorable functional Tovolo Ice Cream containers (that is, if you ever plan on having leftovers!). Here’s mine in action with my favorite cookie dough frozen yogurt recipe. I’m also tempted to get these Tovolo Mini Sweet Treats Tubs for serving individual portions. On the topic of frozen treats, we’re big fans of these Sunsella Mighty Pops silicone popsicle molds. I like that I can make a healthy frozen smoothie that the kids can have in the car on the way to school or to pack in their lunch box. In the summers, we love to make popsicles and other frozen treats. One of our recent favorites is a refreshing Strawberries and Cream Lemonade Pops recipe that can be found here. RMS Living Luminizer. This is the holy grail of fresh dewy luminizing makeup – perfect for your summer makeup routine.My skin is dry, and I find that when I stay hydrated and moisturized and use this product my skin looks its best. Just apply a small amount on your cheekbones, brow bones and temples. It Cosmetics Your Skin But Better CC Cream with SPF 50+ You’ll see rave reviews everywhere you look for this CC cream. It has a great medium coverage and I’m a fan of the 50+ SPF during the summer. While you’re at it, pick up the It Cosmetics Airbrush OMG! Foundation Brush. I love this brush so much, I tossed my Beauty Blenders in the waste bin after using it the very first time. Old Navy distressed RockStar denim. These are part of my summer uniform lately. They are the perfect blend of lightweight, stretchy denim that look great with a casual tee or dressed up for GNO – and the price can’t be beat. Remember to size up 1-2 sizes with these! Here I am wearing a similar pair them while modeling my copycat Anthro tank. Last but not least is the Rosy Outlook Planner. No matter how advanced technology is, I still need a paper planner to map out my lists, meetings and reminders. Once I saw this planner I was smitten. It’s only July, but I’ve already pulled the trigger on this 2016 planner laced with inspirational messages, cute stickers and the week by week layout I prefer. Thanks for stopping by to see what I’m loving lately! This entry was posted in Beauty, Fashion, Food, Home, Uncategorized and tagged 2016, 30 handmade days, Airbrush OMG! Cosmetic Brush, Amazon, Anthropologie, calendar, CC Cream, Cuisinart, eye mask, Favorite things, Friday Favorites, Homemade ice cream, homemade popsicle, Ice Cream Maker, It Cosmetics, lambie, Living Illuminizer, loving lately, Makeup, Old Navy, RMS, RockStar Denim, Rosey Outlook Planner, Shopping, sleep mask, Sleepy lamb, strawberries and cream lemonade pops, Summer Beauty, Sunsella Mighty Pops, Ulta, Williams-Sonoma on July 12, 2015 by fivemarigolds. 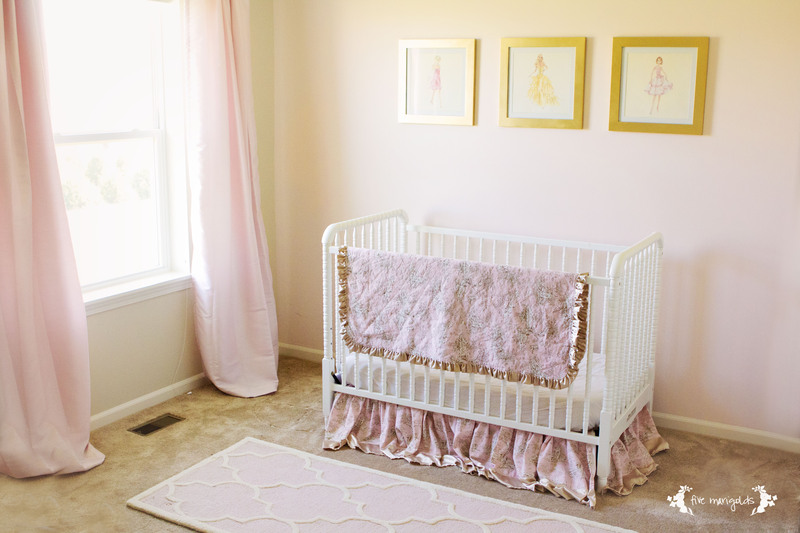 Ever since I’d planned my first born daughter’s nursery 7 years ago, I had a vision for adding vintage Barbie prints to the room that they could grow with. My inspiration came from places like Posh Tots, Rosenberry Rooms, and other upscale design stores who were selling the framed prints for upwards of $135 each. Fast-forward to this year. In the process of moving I realized we had four matted square frames that we’d never used! I think it was one of those things that I thought my husband had returned, and he thought I’d returned. Regardless, it was a sweet score that inspired me to revive this decor idea as we began decorating the kids’ new rooms. This time, I found a way to create this art on the cheap. I scoured Amazon for used vintage print Barbie calendars, and found that there are usually at least two 12×12 calendars available for a reasonable price. I believe I bought mine for around $10. I spray painted my black frames with Rust-Oleum Metallic spray paint I had on hand (love this stuff), inserted my favorite prints, and voila! Vintage Barbie art for less than $15. I love the look of three frames above the crib, but I’m debating adding the fourth and making it a square formation when Belle moves to a big girl bed. What do you think? In addition to the fab blogs in the right sidebar, this post was also featured on Stone Gable Blog. This entry was posted in Uncategorized on June 1, 2015 by fivemarigolds. I recently tried to convince my husband to paint an entire wall of our dining area with black chalkboard paint. He didn’t quite have the same vision I had, so he asked me to hang a chalkboard until we could come to an agreement. I agreed. After all, I’ve had a giant frame in storage that’s been waiting to be used for years. I bought it at a garage sale for around $10 which was a steal…but how do you fill such a large frame without spending a fortune? The chalkboard was the perfect solution. If I hadn’t already had the frame, what I really would have wanted is a rustic wood frame. However, since this was likely temporary, I wanted to make this as easy and inexpensive as possible. The problem: the frame was gold. Really gold. I debated on what to paint it. Silver? Weathered white? Blue? I haven’t committed to a color scheme in our new home yet, so I went with a safe, muted silver. I spray painted it with Krylon Brushed Metallic paint. I had planned to rub wax or wood stain to bring out the details, but I didn’t love that effect on the test areas so I just left it silver for now. For the actual chalkboard, we bought a piece of thin plywood and I sanded it with a hand sander until it was really smooth. After cleaning it with a lint-free cloth, I painted four thin coats of Rust-Oleum Chalk Paint in black, using a foam roller. I sanded lightly between layers when necessary and removed all the dust with a lint-free cloth. When the paint was completely dry, I rubbed entire board with a large piece of sidewalk chalk to cure it, and then rubbed it with a lint-free cloth to erase it. 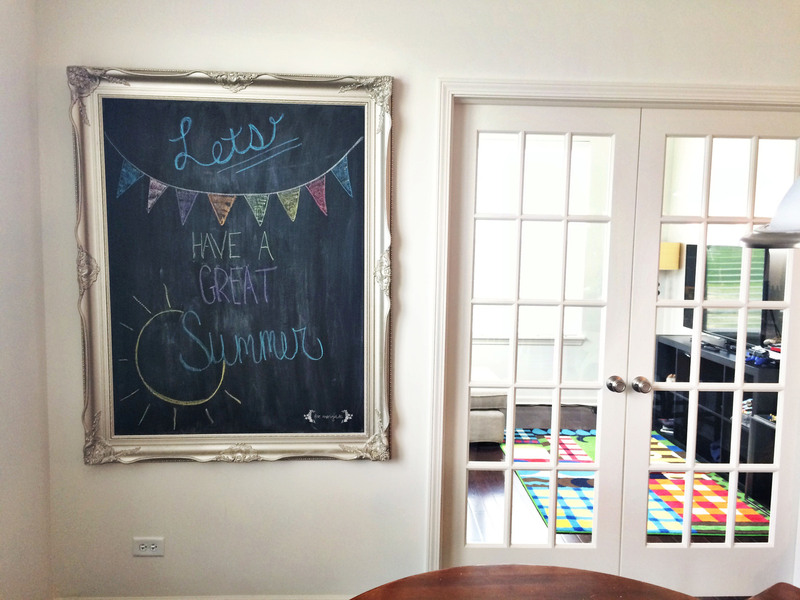 You can wipe it clean with a damp cloth for a clean crisp look, or with a dry cloth, which I prefer, for a true, messy chalkboard look. So far, our family loves this addition to our home. We post fun quotes and verses, and the children love to use it for creating their own art, as well. In addition to being shared on the fabulous blogs to the right, this post was also shared on Stone Gable Blog. 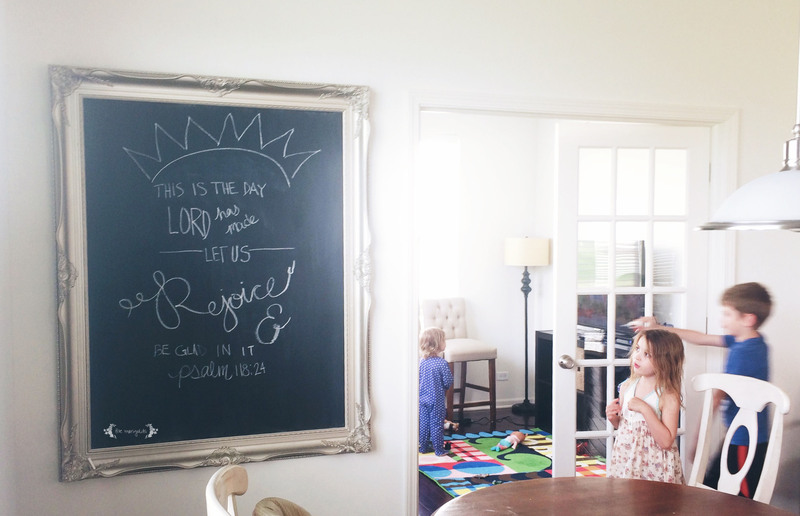 This entry was posted in Decorating, DIY, Faith, Kids, Uncategorized and tagged art, Chalkboard, inexpensive, Krylon Metallic Spray Paint, Ornate, Painting, Project, Psalm 118:24, Rust-oleum, scripture, Verses on May 24, 2015 by fivemarigolds. Today’s April Fool’s gag is brought to you by the (brown) letter “E” and frozen milk. Don’t worry, I made actual brownies to soften the blow of this joke. What are your favorite April Fool’s Day gags? This entry was posted in Uncategorized on April 1, 2015 by fivemarigolds. This year, Dub wanted his party to be all about Minecraft. I didn’t want our home to look like it threw up Minecraft-licensed decor, so I went with something that we all could get excited about. We weren’t having a big celebration at home either, so I wanted to keep this simple and fairly inexpensive. First: the centerpiece du jour: his Minecraft cake. Kind of a boring concept, but this is a representation of THE pixelated cake featured on the video game. I was more than happy to outsource this portion of the party and Dub was in love with how it turned out. It was exactly what he wanted! Next, I created the theme using a brown dollar store tablecloth and some tissue paper “grass.” Super inexpensive for one package to cover this table, and the kids were fascinated by this! I created a simple and inexpensive tissue paper bunting that added some visual interest in the party theme color (tutorial here). Finally, I like to decorate with party favors, because it’s the decoration that cleans itself up as the guests leave. I bought some green lunch bag sized paper bags and cut felt into the shape of a Creeper face. Really, this would have been so much easier with black construction paper and my Silhouette SD, but black felt was what I had on hand so that’s what I used. I filled the bag with goodies like gold and silver ore, Mike & Ikes, a growing green bug, and I repurposed my Minecraft Valentine printable to wrap boxes of Nerds candy. The highlight of the goodie bags was a Lego Steve creation I made with the help of Pinterest and the Lego Pick-A-Brick tool. Stay tuned, I’ll post the tutorial on that soon! 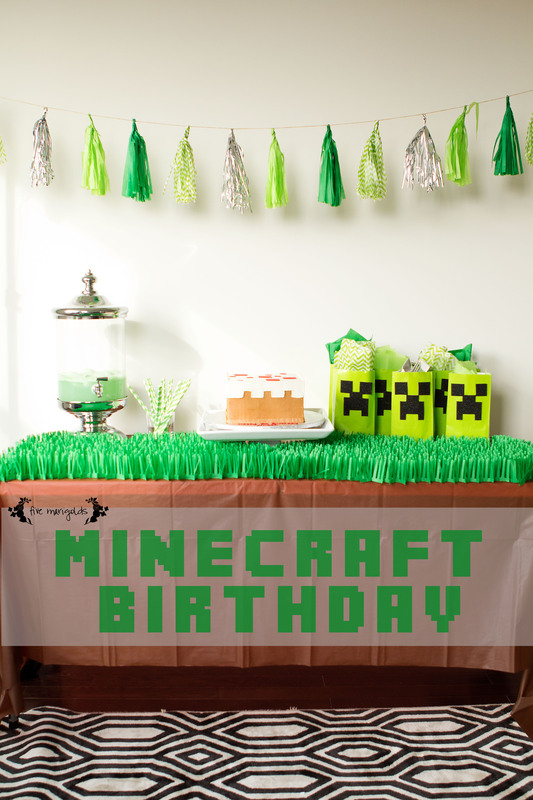 This entry was posted in Uncategorized and tagged Banner, Birthday party, boys, Budget, Bunting, Creeper, diy, dollar store, Favors, goodie bags, Lego, Mike & Ikes, Minecraft, Nerds, party decor, Steve, Tissue Paper on March 14, 2015 by fivemarigolds. From time to time, I will link readers to products I've enjoyed and used myself. In exchange for purchases made, I may receive a small percent of the total purchase. 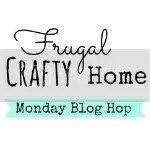 Your support helps me continue offering the tips and free printables you love. Thank you for your support!